The push to remove mouth to mouth from CPR was controversial in the world of CPR training. The idea finally found its feet after many years; the American Heart Association now recommends hands-only CPR—skipping rescue breathing—for untrained rescuers who see a victim collapse in front of them. We've all been taught to make sure the patient had an airway first, and if the patient was not breathing, to breathe air into the patient with mouth-to-mouth. Only then, if the patient did not have a pulse or signs of circulation, we were taught to compress the chest to pump blood through the body. That thinking was flawed. A look at how the body is designed helps illustrate why the traditional approach to CPR had been backward. Why Do We Focus on Breathing? Airway and breathing are vital, there's no question about that. The proof is in the brain. Our brains' most basic needs are centered in our brain stems, and the most basic of all is the need to breathe. Even as the rest of the brain is damaged from illness or injury, one of the absolute last functions to go will be the drive to breathe. Even the structures that support breathing are built to be protected. Nerves that move the diaphragm, a muscle in the base of the chest used for breathing, are found at the very top of the spinal cord so they'll be the last nerves damaged if the spinal cord is injured. Those are the nerves the late Christopher Reeve damaged when he fell off a horse, leaving him on a ventilator for the rest of his life. Our focus on airway is not misguided; we took our cue from the body itself. Unfortunately, we missed a major point. While breathing is the most important item on the brain's to-do list, pumping blood isn't even up to the brain to remember. Pumping blood is a function of the heart, and the heart does it without even being told. Our heart muscle is the only muscle tissue in the body that doesn't require an outside stimulus to contract. It happens automatically. The heart can pump blood even as the brain is trying to focus on breathing. When the brain loses the ability to direct breathing, the heart will still be pumping blood until it completely runs out of energy. So the brain keeps air going in and out while the heart keeps blood going around and around. They work together, but they're independent. If the brain stops working, the heart can continue. On the other hand, if the heart stops, so does the brain. The circulatory system (heart and blood vessels) and respiratory system (lungs and airways) work together like a supply chain, moving oxygen to body tissues and removing carbon dioxide. The bloodstream is the highway, with main arteries and a network of side streets, all with one-way traffic. The lungs are like a giant loading dock where oxygen is dropped off and carbon dioxide is collected. Imagine a truck on a highway. That truck's goal is to always be full and on the road. Moving cargo is his way of making money. He has just left the dock with a load of oxygen on his way to a bunch of factories that need it for fuel. He'll drive through the biggest interchange in the whole system--the heart--and then take the aorta freeway. Just past the turnpike, he'll take the carotid artery exit heading to the brain. Once he gets there, he'll drop off a little bit of his oxygen—whatever the brain cells need—and pick up the garbage: carbon dioxide. Now he's heading back to the dock with a truckload partly of oxygen and partly of carbon dioxide. He's still loaded, just the mix of his cargo is a little different. When he gets to the dock, he'll drop off carbon dioxide and pick up more oxygen for another trip around. The lungs have taken a breath, transferring the carbon dioxide out and bringing fresh oxygen in. The loading dock is ready for the trucker to return. If there's a problem at the loading dock (the lungs didn't breathe for some reason), he can go on around one more time with the cargo he already has. The little truck carries enough oxygen for a few delivery trips. Every once in a while, there's an accident on the interchange and the whole system stops. The body's version of bumper-to-bumper, standstill traffic is known as cardiac arrest. When that happens, the most important thing is to get traffic moving (blood pumping) again. Replenishing the loading dock (taking a breath) won't help because the trucks can't get there to pick up the oxygen anyway (blood's not moving). Remember, the trucks carry enough oxygen to deliver two or three times, not to mention several trucks (red blood cells and other blood products) are on the aorta freeway (and other big arteries) that haven't even had a chance to deliver oxygen at all yet. All you have to do is get them moving. The body's transportation system is the most important. It's not complicated--not nearly as complicated as the brain is, anyway--but it is vital to keep the other parts working. It takes a few pumps to get the blood moving. Stopping chest compressions to do mouth-to-mouth interrupts that flow. 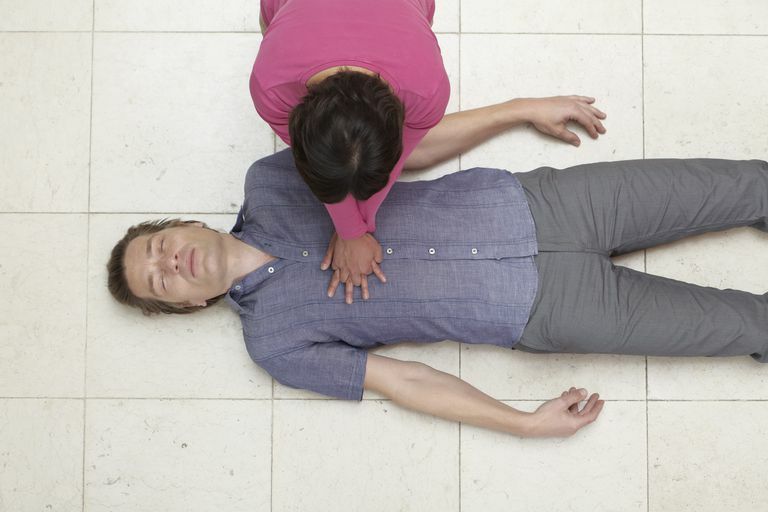 Research has clearly shown a benefit to chest compressions without mouth-to-mouth. Even if it goes against your grain as a salty old paramedic who learned how to do CPR with rescue breathing, there's no way to ignore the science. Focusing on pumping blood during CPR, rather than on moving air, makes a lot of sense. SOS-KANTO Study Group. "Cardiopulmonary resuscitation by bystanders with chest compression only (SOS-KANTO): an observational study. "The Lancet. 17 Mar 2007. Ewy, GA, et al. "Cardiocerebral resuscitation for cardiac arrest. "Am J Med. Jan 2006.